On July 13, 1998 at 4 p.m. I was there when the Mayor of San Francisco, Willie Brown Jr. and the Muwekma Ohlone met in the Mayor's chambers at 401 Van Ness to present and discuss some important issues affecting the Muwekma Ohlone at the Presidio of San Francisco and the extended Bay Area. Mayor Willie Brown afforded the Muwekma an opportunity to present our unique case to him. He listened as we explained to him the importance of getting back on the Federal Register and the significance of the "right of first refusal" as it pertains to excess property and various military base closures. We made known to him that the Board of Supervisors had passed a resolution tabled by Supervisor Jose Medina and unanimously endorsed by all the other Supervisors from the City and County of San Francisco. This resolution officially recognizes the Muwekma Ohlone Tribe as the aboriginal inhabitants of San Francisco and strongly supports our efforts to regain Federal recognition. The Tribe reminded the Mayor of his previous support and requested the support of the City and County of San Francisco. 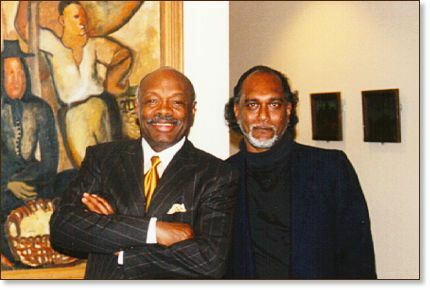 Mayor Willie Brown, Jr. promised us in writing that he would be with us and help us attain our goals. "You have my support" he said and this was all we wanted to hear. We requested a meeting with Mayor Willie Brown on July 4, 1998 after his speech at the event held at the Presidio Officers' Club. July 13, 1998 at 4 p.m. he granted us our request and accommodated the Muwekma Ohlone. We thank you Mayor Willie Brown.